Staggering Stories - Exposed... War of the Daleks - The Truth! Exposed... War of the Daleks - The Truth! Tony Gallichan finally exposes the shocking truth in this Staggering Stories Exclusive! For years fans of the not-as-popular-as-it-once-was-I-liked-the-one-in-the-scarf television programme have been left with a major conundrum. Just what was the original plot line John Peel submitted to Virgin Publishing for "War Of The Daleks"? Many rumours have been muttered by various in the know fan luminaries, your Cornells, your Roberts, your Yadleys, but no one has ever seen that illusive original plot synopsis. No one, that is, until now. After literally minutes of careful negotiation, Staggering Stories can reveal that our very own George Macfadyan has obtained that first draft - and the behind the scenes story that shows just how close Virgin came to ruination. Peel had long wanted to write a Dalek story. When Virgin won the rights to publish original Who fiction he immediately began to tidy up his long written proposal. Fate was to get in his way, however, when he was told that he would be opening the range and could he please write a little something to do with fallen gods, computer viruses and lesbians. Eventually he submitted "War Of The Daleks". At first, Bex Levene was enthusiastic. Peel had the ear of Terry Nation and had included a "Great Old One" for the seventh Doctor to face - a key requisite to any Virgin Who book after they realised that the range might need a bit more then just teenage angst and Cyberpunk storylines. And even though this particular Old One was the Celestial Toymaker from the television show, she gave the go ahead to Peel to write the book. However, with deadlines looming, Peel was becoming very difficult to track down. Then Terry Nation's agent rang the Virgin offices demanding to know just why the Daleks had been redesigned slightly for the proof cover he had been sent. Levene replied that the illustration for the book had been provided by Peel himself and was based on his descriptions of the Skaroan gits contained within his manuscript. Hancock was insistent that the Daleks had never looked as shoddy on television. Levene suggested he watch "Destiny Of The Daleks". Hancock also stressed that the Daleks would never spend an entire adventure going up and down corridors shouting and little else. Levene suggested he watched "Destiny Of The Daleks". However, this sparked alarm bells in Levene's mind. She had left the editing of the book with Gareth Roberts, who had been employed to ease the load. After questioning Roberts she discovered the truth. Peel's book was atrocious. Awful. It should have been pulped before going to shops to cut out the middle man. Asked why he had allowed Peel to continue writing, Roberts replied that he thought Peel was "doing a season seventeen". Roberts was never allowed the chance to edit the Virgin Who range again. He just looked through the slush pile. Levene now had a problem. Advance publicity had already been sent out, fliers etc. Damage control was now the order of the day. First she announced that the book would be replaced by a submission by Ben Aaranovitch, "So Vile A Sin". Then it was announced that "Ben's hard drive suffered a catastrophic failure. Kate Orman will be finishing the book for publication at a later date." So, just how bad was Peel's manuscript? The TARDIS lands on a flat plain after interference. Roz and Chris exit the Ship and are told by a mysterious being that they have to play a game - with the Daleks! The Doctor emerges and agrees on their behalf. The adjudicators stand on the board whilst the Doctor rolls the dice for their moves. If they land on a certain square then the Daleks are allowed to exterminate them. After several very narrow escapes, the Doctor makes his last roll. Roz and Chris reach the centre of the board and attempt to enter the Dalek Emperor's lair. However, the Emperor has been tipped off by the Toymaker and is ready for them. Roz is killed but Chris manages to destroy the killer. The Doctor activates a gizmo from his pocket and disperses the Toymaker. The Daleks are sent back to Skaro after the Emperor boasts that the planet was never destroyed and it was all a smart arse plan to trick Davros. Grief stricken, the Doctor admits to Chris that all this was part of his plan to get rid of the Toymaker, but hadn't allowed for Roz's death. The TARDIS leaves with her occupants barely talking. 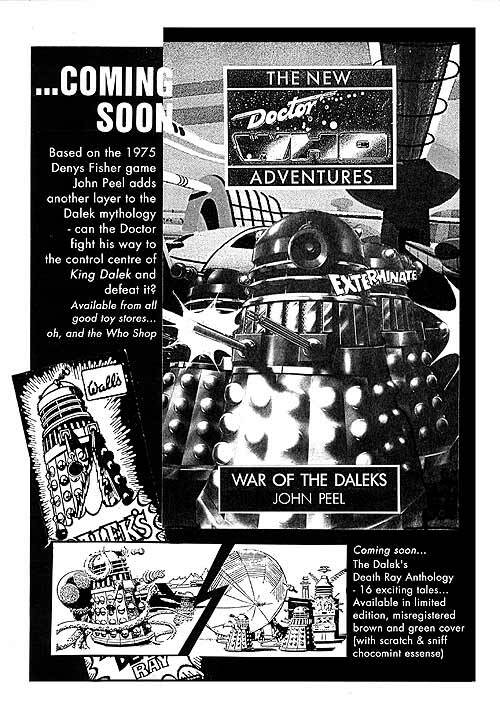 A copy of an advance publicity flier for the original Virgin New Adventure "War Of The Daleks"